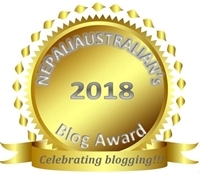 As I have mentioned before, Nepal follows a different calendar than the Gregorian calendar so Nepali New Year falls on mid-April instead of 1st of January. Bikram Sambat or Nepali Calendar or Nepali patro is approximately 56 years and 8½ months ahead of the Gregorian calendar. Unlike Gregorian months, the lengths of Nepali months are not predetermined, and change from year to year, varying from 29 days to 32 days. The year 2074 started yesterday as 1st of Baishak, 2074. In Nepal, people celebrate Nepali New Year in many different ways. 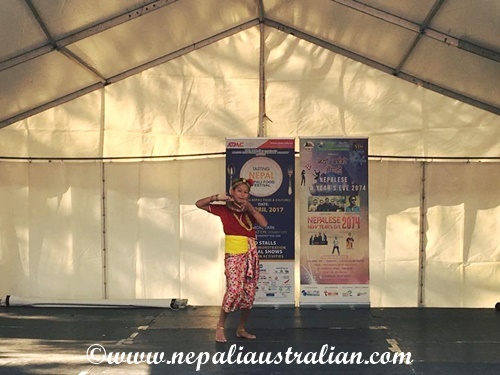 Please read this post to learn more about celebration of Nepali New Year in Nepal. 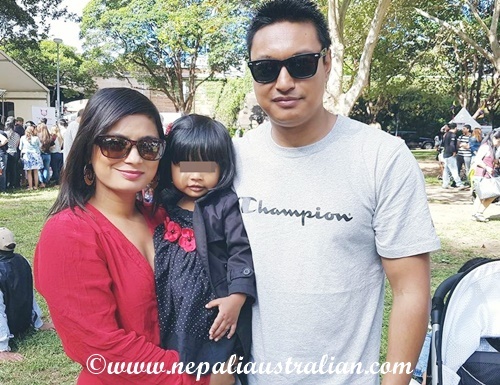 For us, in Australia, this year had been great as the New Year Eve fell on Easter long weekend so it is double celebration here. I will write more about about Easter long weekend soon. 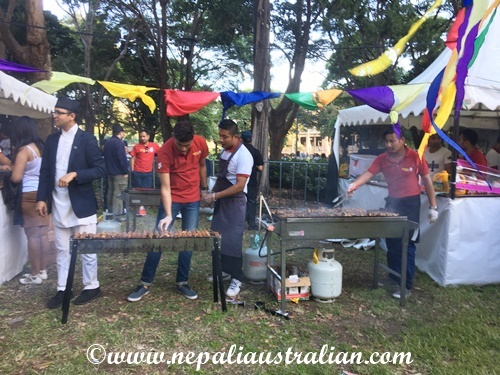 To mark the occasion, on Saturday 8th of April, “Tasting Nepal “, a food festival entirely dedicated to Nepali cuisine was organized for the first time here in Sydney. 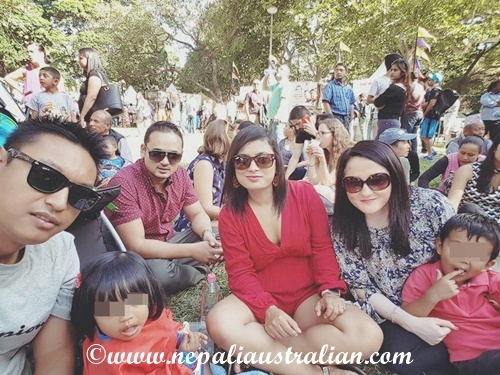 As there was to be food and entertainment, we decided to go and enjoy the festival. 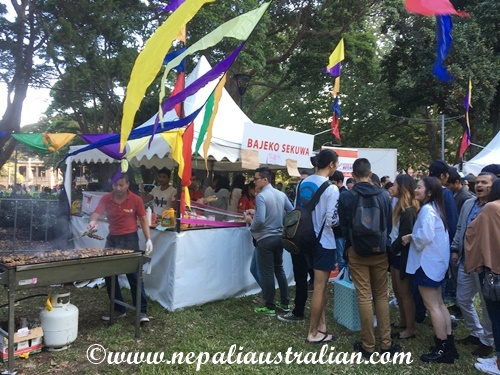 The festival featured food and culture from various parts of Nepal including Momo, Sekuwa, sel roti, chatpat, puri, jeri, samay baji and many more varieties from various restaurants in Sydney. But the highlight of the event was a stall of Bajeko Sekuwa, one of the popular restaurant chains in Kathmandu. The chef came all the way from Nepal just to join the event and I am sure he was not disappointed as there was a long queue for the sekuwa throughout the day. 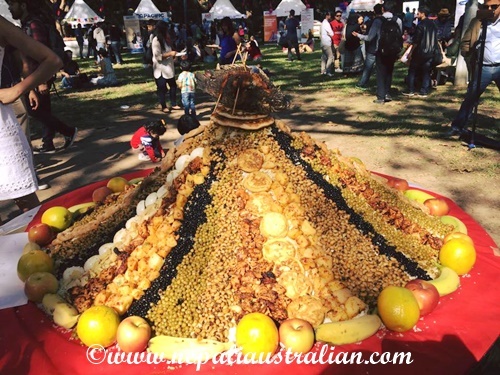 Personally for me, the highlight was the pyramid of Samay baji displayed by Guthi Australia. Check out the video and see the detail yourself. I was surprised to know that even AS hadn’t seen such a pyramid in Nepal before. For me, it was a yearly thing that they did in the temples near us. 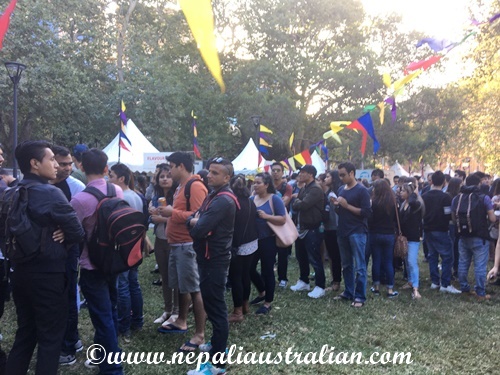 As the number of Nepalese are increasing in Sydney, it was no surprise that the festival was busy. We had a great time with our friends and family as well. Wishing all of you a very Happy start of new year once again from 3 of us. Thank you from the bottom of my heart for riding along this journey with me. I appreciate all the love and support you guys have given me throughout the year and I hope you continue to do so this year too. 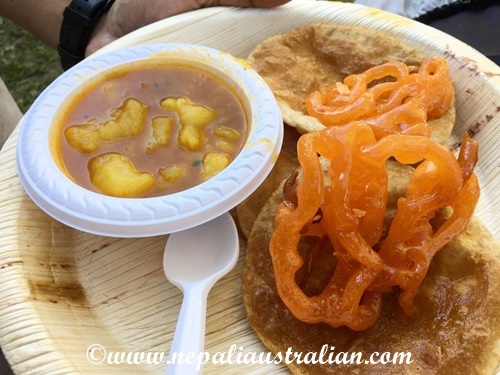 This entry was posted in Foodie, Nepal, Nepali Culture, Nepali Festivals, Nepali food, Newari Culture, Newari Food and tagged australian, australian nepali, Bajeko Sekuwa, chatpat, chowmein, jeri, M from nepaliaustralian, momo, Nepal, Nepalese, Nepali, nepali australian, Nepali blog, nepali food, Nepali new year, nepali new year 2074, nepali noodles, Nepaliaustralian, noodles, Puri, samay baji, Sekuwa, Sel roti. Bookmark the permalink. I think the organizer will fix it . Happy new year to you too! we call it Pohela Boishakh in Bangladesh – I didn’t realise Nepal had the same thing (but it shouldn’t come as a surprise really!). Thank you so much. I know, we do share lots of different festivals too. Wow you are lucky gal, that in Sydney you get to celebrate the festivals. Here in WA its hard and we miss our family even more. Between lovely pics.. ChHori is growing up quickly. We are very lucky for sure. 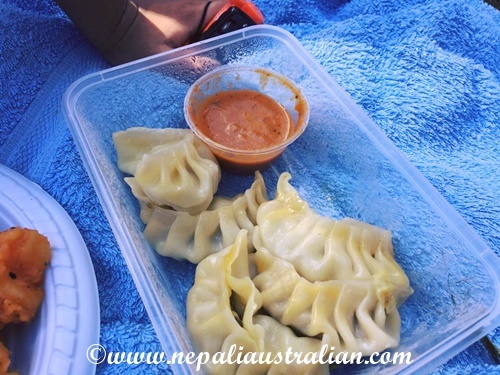 We can buy almost anything from Nepal in Sydney these days . 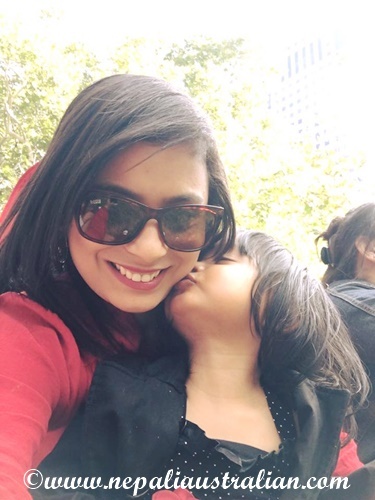 I know Chhori is getting really big quickly and sometimes she surprised us by saying things we haven’t expected at all. 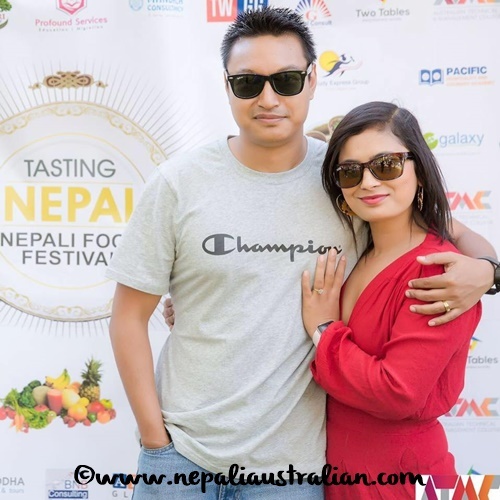 What a great event in Sydney – all the mouthwatering Nepali dishes – yum 🙂 Samay Baji looks beautiful too! I would have gone to Bajeko Sekuwa stall too despite the queue! I just made some chicken curry and enjoyed it with some chiura and beer for New Year’s hehe. 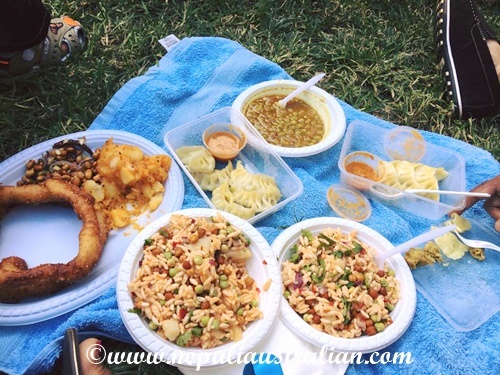 I know, we are very lucky to have so many Nepalese stuffs here. 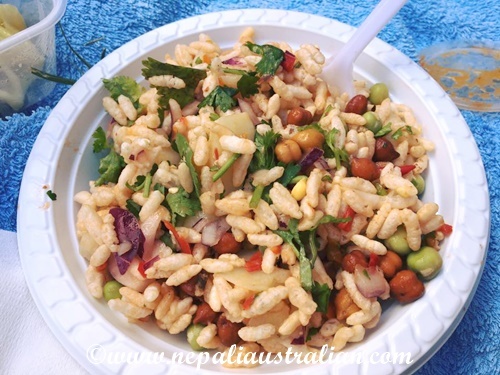 We can buy everything foodwise from Nepal and all these festivals and gathering helps us to miss home less.